Ann Wren, one of our members, is a member of the WDP Scottish Committee. She has written a one-page newsletter about WDP in Scotland. It can be downloaded by clicking here. As she says in the letter, please contact her if you would like to have someone come and speak at a meeting. Click here to email her. There’s more information on the WDP Scotland website. Motherwell branch hosted a special service on 18th December. Read more on the branch page. 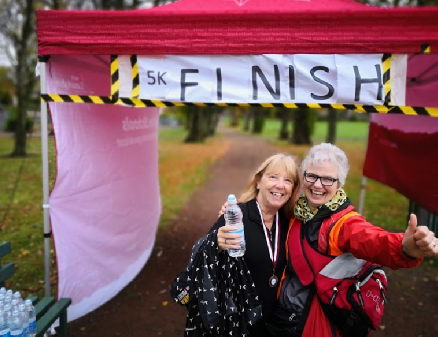 Further to the item below, over fifty local residents, friends, volunteers and community partners gathered together on Saturday 20th October for a 5K & 1K Fun Run, Walk, Jog in The Duchess of Hamilton Park at Motherwell. 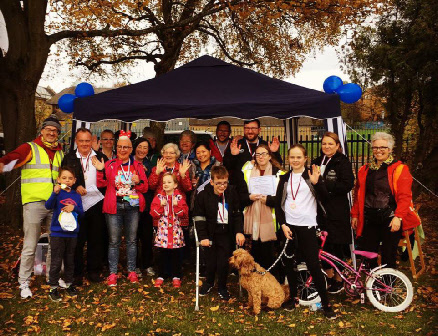 This Fun Event, organised with the support of Holy Trinity Mothers’ Union, Motherwell, provided an opportunity for increasing physical activity and joining in an all age activity in the community. North Lanarkshire Active Schools from the Community Sports Hub at Dalziel High, and Voluntary Action North Lanarkshire partnered with Holy Trinity Church giving advice, support and equipment and recruited volunteer stewards. John Brown DL; CEO of Lifeskills Centres kindly sponsored the water for participants. First Aid duties were covered by St. Andrew’s Ambulance Scotland. Grant funding to cover costs of medals and administration was provided by a Community Grant from North Lanarkshire Council. Katharine Kilgour the Branch leader of the Mothers’ Union at Holy Trinity praised her team of branch members,and thanked church and local people for their support, saying she was ‘delighted to see all ages and abilities join in the fun and the response was terrific from across the community’. Jill Cameron, our Diocesan President joined in this first event of it’s kind, Jill is pictured here (left) with Katharine Kilgour. The path network in the Duchess Park was utilised to complete 1K and 5K events with people invited to run, jog or walk at their own pace. Ages ranged from 6 to 80, with parents, children and grandparents taking up the challenge. Everyone completing the course received a medal and a gift pedometer provided by Mothers’ Union central HQ in London. Volunteers from Voluntary Action North Lanarkshire were recruited and coordinated by Kirsty Struthers to assist with welcoming, registration, stewarding and encouraging participants for their events. 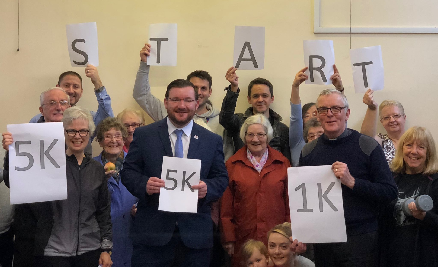 Councillors Meghan Gallacher and Paul Kelly and Agnes Magowan joined in with taking up the 5K challenge and each were involved in starting races, and presenting prizes and certificates. Our Diocesan President, Jill Cameron and her daughter and granddaughter were at Holy Trinity Motherwell on Wednesday 19th September 2018 to join with the branch’s Community partners (Active Schools, Voluntary Action North Lanarkshire, local councillor Paul Kelly and church community) to support the promotion of the new Mothers Union Community All Age 1k and 5k fun event to be held at Duchess of Hamilton Park, Motherwell on 20th October 2018. Our Provincial President was invited by the Holy Trinity Branch to a special event in Motherwell on Tuesday 21st August 2018. Also invited was the Lord Lieutenant of Lanarkshire who was represented by Depute Mr John Brown DL. Coffee and lunch were provided for guests. 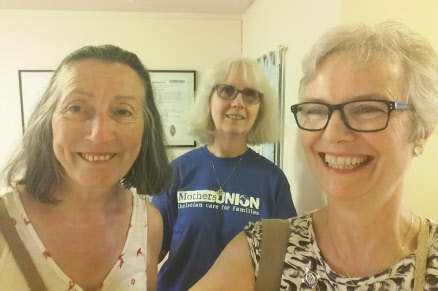 The main event was a visit to the Mothers’ Union Re-Launch Exhibition at the North Lanarkshire Heritage Centre, Motherwell. The occasion provided an opportunity to meet local MU members from Motherwell and Hamilton branches. Wider community contacts joined us who had supported the exhibition. Jean addressed the group after lunch expressing thanks to the Holy Trinity Branch for their hospitality. She commended all their efforts in reviving the work of the Mothers’ Union in the locality. She praised the ‘outward looking’ approach to fulfilling the objects and aims of the worldwide movement. Jean was accompanied by Elizabeth Benton, Diocesan President for St. Andrew’s Dunkeld and Dunblane. 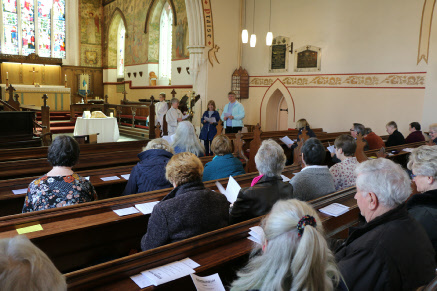 The Glasgow and Galloway Festival service on Saturday August 11th, focused on walking in Mary Summer’s footprints. Rev. 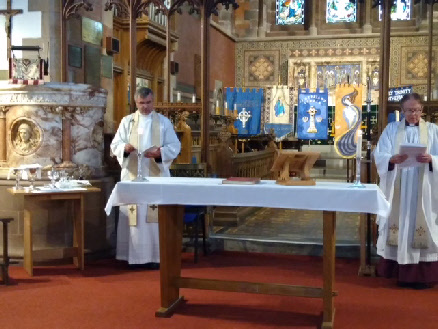 Dominic Ind of Helensburgh was only installed at St Michael and All Angels on the previous Saturday, so this was his first introduction to Mothers’ Union members in this diocese. This was the last service Bishop Gregor would be here for, as he is retiring so it was a blessing to have him. He spoke about how inspiring Mary Sumner was in her day, that she had a mission and definitely worked out of her comfort zone. Our chaplain Rev Lucy led the service beautifully and members from St Michael and All Angels took the Intercessions. We were well represented by our new branches of Motherwell and Hamilton and many members came a great distance. We all enjoyed getting to know one another over lunch. 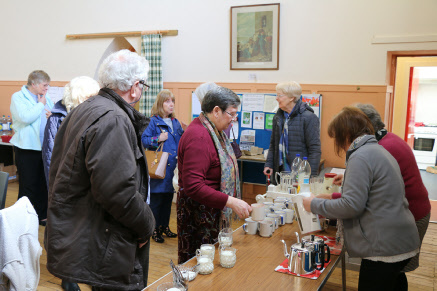 The newly re-established branch at Holy Trinity Motherwell has created an exhibition about the work of the Mothers’ Union within the Community Exhibition Space at North Lanarkshire Heritage Centre. Above are some of the team from the branch who were involved in setting up the exhibition. Please go to the branch page for more details. Our Spring Council service and meeting was held on the 24th March at Holy Trinity Church in Kilmarnock. The members showed their support for our new Diocesan Treasurer who was commissioned at the service (above). The business meeting took place in the hall following a sharing lunch where the team at Kilmarnock provided tea and coffee (above) and some lovely cakes and tray bakes. Thank you to them and all who made the effort to come along to make the meeting a success. The MU theme for 2108 is In Mary Sumner’s Footsteps. So how can we walk in her footsteps? She dreamt of a time when every home would provide a nurturing healthy environment for children with faith as the foundation of family life. She campaigned for the age of marriage for girls to be raised from 12 to 16. She spoke out against condemning and casting out unmarried girls with children and indeed cared and protected her own niece and her illegitimate son. She was active in many areas of social injustice and not afraid to go against the social norm despite resistance from the establishment. We also try to continue the work she started. Some MU members help in prisons giving positive support to families. Christmas cards are delivered to prisoners to show our care for them. We support and display The Shoe Exhibition, which raises awareness of domestic abuse. Some of us have also been trained as spiritual befrienders for the victims of human trafficking. Many branches now take part in the 16 Days of Activism against Gender Violence. We visit Care Homes, collect for Foodbanks, support refugees, donate goods to Maternity Hospitals and support other charities in their work across Africa. All across our diocese there are MU Branches doing amazing work both at home and abroad. At a branch I visited last year one lady interested, but not yet a member, said to me, ‘I didn’t realise MU did so much. It’s amazing how small things they do can mean so much to others.’ One example of this is where we donate toothpaste and toothbrushes to the Smileawi project in Malawi. I was reminded recently that a tube of toothpaste costs the equivalent of one day’s wages there. Such a small thing for us but not for the recipient. At the heart of all our work is of course prayer. We thank Sue Brough for her continuing work on our Prayer Chain. It is so special to be able to pray with members at our meetings and services. If you are able please take a look at the MU central website and resources for ‘In Mary Sumner’s Footsteps.’ They are very useful and have lots of information and ideas for meetings.